Cooking with Kids – The foodie revolution is in full swing—but why should grown-ups have all the fun? From cooking shows starring “junior” chefs to kitchen toys, kids are discovering the culinary arts…and having a blast doing it! Cooking with kids is an amazing opportunity to bond, and teach your kids about nutrition, math and measuring, food safety, problem solving…all skills they’ll use well into adulthood. Plus, Did you know that kids who start cooking before the age of eight are 50% more likely to make meals from scratch each week when they grow up,1 and they’re much more likely to try new foods and flavours when they help prepare them? Depending on your child’s age, there are many ways for your child to participate in the cooking process and learn basic math skills along the way. Using a measuring cup to measure the right amount of ingredients will help your child learn about numerical concepts such as fractions. When they see the cup is half full, it helps them understand the concept of half. For younger kids, they can help count the number of tablespoons to add to the mix. Classifying each ingredient and naming the measurement of it introduces an entirely new set of words for your child’s vocabulary. 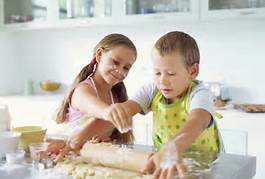 If your child assists you regularly they will become familiar with cooking terms and further enhance their vocabulary. Picky eaters are more likely to try something if they have been part of the cooking process. Children gain a lot of pride and self confidence from helping out in the kitchen and they will gladly eat their creations or at least give it a try. Talk to them about the smell and taste as they are cooking it. Let them try a piece of the meal as it is being prepared. You may see improvement for those picky eaters. Giving your child a sense of accomplishment is extremely important in boosting their self esteem and cooking is a wonderful way to do that. At Alpha’s Preschool Academy, we want our children to be confident and independent individuals and we love to plan cooking activities for our Preschoolers and Toddlers alike. We mix ingredients to make things like Play dough or moon sand. The children are always excited to see what they can learn next!